Even if you can’t make the trek to Munich, you can still enjoy some of the same beers being served across the Atlantic. 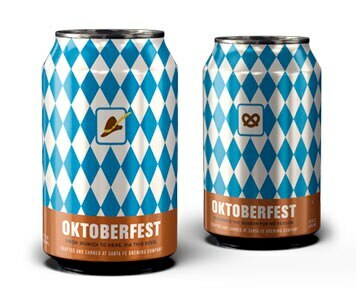 In fact, three breweries featured on GAYOT’s Best Oktoberfest Beers are among the six that are allowed to serve beer at the true Bavarian Oktoberfest. The Oktoberfest style, also known as Märzen, was originally brewed around March (Märzen derives from März, the German word for March) before modern refrigeration, when brewing during the summer was problematic due to high temperatures that could result in bacterial infections. The beer was lagered (kept in cold storage) over the hotter months and brewed at a higher gravity (or alcohol content) to help it maintain stability against the summer heat. 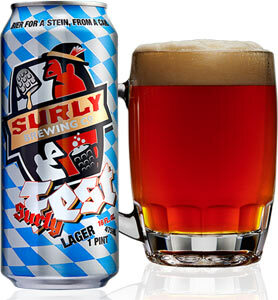 This German lager style tends to be full-bodied, malty, toasty and dark copper-hued, with a slightly greater alcohol content and just enough hops to balance the sweetness. It’s an ideal beer for early fall drinking — lederhosen or not. For additional brews that taste wonderful this time of year, take a look at our Best Beers for Fall. Be sure to also check out GAYOT’s Complete Guide to Beer. The Ayinger Brewery, founded in 1878 and located in the Bavarian village of Aying, is no stranger to brewing medals — its Oktober Fest-Märzen is one of the most highly respected Märzens in the world. It pours a golden color tinted with amber, and offers aromas of floral hops balanced with slightly sweet malt. Flavors of caramel and nutty malt form the backbone and it’s balanced with a perfect pitch of hops to fight off lingering sweetness. Its medium body and moderate alcohol content is not overpowering, making this an easy drinking beer that will pair nicely with a plate of sausage and sauerkraut. Literally translated as “hop time,” Hopzeit is inspired by the flavors of a Märzenbier and combines classic malts with the latest hop varietals from Germany. A cross between an IPA and a German Märzen, it’s quite possibly a new beer style that has never been tried commercially. The Munich, Vienna and Pilsner malts create a toasted breadiness typical of a Märzen, but there’s also a bite from the German Herkules, Sterling and Hull Melon hops, which are more earthy and melon-like than the citrus notes usually found in IPAs. This experimental Oktoberfest from Deschutes appeals to those wanting to celebrate the season without giving up the hops. 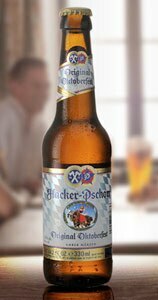 The checkered blue and white pattern on the label represents the Bavarian flag, while the Bavarian Augustiner Lager yeast it’s fermented with adds to its European authenticity. Imported Pilsner and Vienna malts, along with German Hallertau hops, bring balance. This seasonal option is richer, more full-bodied and hoppier than most representations of the style, and pours a long-lasting, frothy white head. Hacker-Pschorr is one of Bavaria’s pre-eminent breweries, having been in existence since the 15th century. They’re actually one of the original breweries commissioned to brew beer at the first Oktoberfest in 1810, and are one of only six Munich breweries allowed to serve beer at the city’s world-famous Oktoberfest. Hacker-Pschorr’s traditional recipe utilizes natural spring water, dark- and light-colored malt from two-row Bavarian summer barley, a centuries-old Hacker-Pschorr yeast strain and Noble Hallertau hops. With a warming amber color, rich and clean toasted malt flavors and a sweet hop aroma, this legendary Oktoberfest beer is light, delicious and truly authentic. The Staatliches Hofbräu brewery was founded in 1589 in Munich as a court-owned enterprise run by a duke. This is not exactly the typical Oktoberfest brew. Hofbräu’s hops are a bit more prevalent, the alcohol content slightly higher and the appearance a shade paler than the classic Märzen. Light caramel and malt flavors add to the beer’s fine balance, particularly when paired with bratwurst or suckling pig. Ninkasi, an Oregon-based brewery that stays true to the region, debuted an Oktoberfest beer in 2014 to honor the hop harvest. Co-founder Jamie Floyd celebrates the Pacific Northwest with Pilsner malt and regional Sterling, Willamette and Tettnang hops. The result is a copper-colored beer with four different malts that sips like sweet toast, but still finishes dry, which is a testament to the finesse of Floyd’s team in the brewhouse. 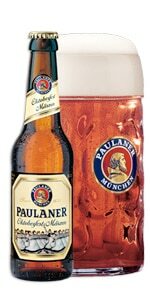 Minim friars founded Paulaner in 1634 and named the beer in honor of the patron saint of their own order, Saint Francis of Paola. Characteristic of the style, this Märzen is amber-hued with a full malt aroma and a thick, creamy, foamy froth. The taste offers a decidedly nutty light roast with an emphasis on malt sweetness that’s smooth and well balanced. It’s no wonder that Paulaner is one of the only officially designated beers allowed to be served at the Munich Oktoberfest. This lager from New Mexico’s oldest brewery (founded in 1988) pays tribute to the original Märzens served at Ludwig I’s wedding. Its use of German ingredients — Pilsen and Munich malts with Hallertau and Tettnanger hops — make it a traditional representative of the style. The malts and 100% natural spring water result in a beautifully clear golden-amber color and a mild hop presence allows the semi-sweet bready, malt-forward flavors to dominate. This brew is proof that American brewers are equal to the task of recreating their own versions that can stand up to their German counterparts. The American-made Märzen displays a deep amber hue and uses three types of rye to deliver a spicy biscuit-like flavor that complements floral Sterling hops, which (gasp) are grown in the United States. German drinkers, however, will recognize Vienna malt, which rounds out the texture in the bottle, or better yet, your pint glass. Located just north of Munich, the Weihenstephan Brewery is no novice — its roots in beer-making go back to the year 768. Weihenstephan became licensed in 1040 and is recognized as the world’s oldest working brewery. Its Festbier is a true German brew, with malt and Noble hops from the Hallertau region in Bavaria. The result is a full, rich-bodied, mildly hopped seasonal lager that’s crisp and refreshing, with a deep gold appearance and full carbonation. At 5.8 percent ABV and 26 IBUs, Weihenstephaner Festbier is a perfect fit for the style.